A new publication on “Environmental Ethics” by CUSA’s Richard Matthew, Bryan McDonald and Heather Goldsworthy is now available as part of an edited volume on The Ethics of Global Governance, ed. Antonio Franceschet (Boulder: Lynne Rienner, 2009). 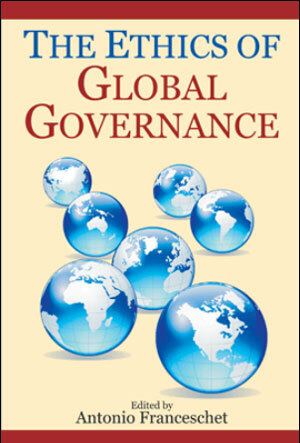 In this volume, the authors analyze the ethical controversies that are central to global governance as states and other actors navigate a complex world order. Covering the gamut of fundamental issues-sovereignty, the role of civil society, UN reform, democracy promotion, humanitarian intervention, human security, the global economy, the environment-they offer the reader a deeper understanding of the significance of ethics in the politics of global governance and at the same time provide a fresh perspective on contemporary dilemmas in international relations.